As a responsible pet owner, it's necessary to prevent your pets from being affected by these parasites. Ticks transmit not only Lyme disease, but also other illnesses like babesiosis (a malaria-like disease), ehrlichiosis (a bacterial infection), and even tick paralysis. There are more than 200 species of fleas affecting cats and dogs, and these can also transmit disease, not to mention lead to a costly and time-consuming extermination process if your home becomes infested. The best defense is to keep your pet on a year-round preventive medication. Why is our product the best on the market? Based on natural oils and extracts as the main ingredients, 100% safe and healthy for your pets, adjustable to large, medium, and small cats, even young kittens. 6 month ultra effective protection against insects harmful to your pet including flea, ticks, larvae, mosquitoes, and lice. Directions of use? Put the repellent collar on the pet's neck, adjust the size and buckle it to size. Excess doesn't need to be cut off if not desired, excess collar can be wrapped around the neck again and buckled in place. This excess allows to adjust collar as cat grows. Wash hands afterwards. Monitor your cat's improvement, leave on for a full 6-month period for maximum protection. If infestation is severe, consider multiple treatments. Package contents: Flea and tick collar, and premium quality metal box (For disposal of collar after end of treatment). LONG LASTING PROTECTION - 6 months continuous and effective defense against fleas, ticks, lice, mosquitoes, and larvae. The collar will serve as a repellent and a shield to all these insects to keep your pet free from them. BRAND NEW COLLAR DESIGN - Sleek new anti flea collar design allows to adjust the collar depending on cat size, small young cats or big adult cats. Buckle/belt adjustment prevents cat from loosening the collar and sliding over its head. Trust our premium collar to take care of your cats. 24-HOUR FAST ACTING NATURAL FORMULA - The effective non toxic formula used in the collar acts fast to start seeing results and improvement within the first 24 hours of use. WATER RESISTANT - Anti tick collar is made out of a durable and strong material that can resist water, so don't worry about bathing your pet with the collar on or if your pet gets wet in the rain. 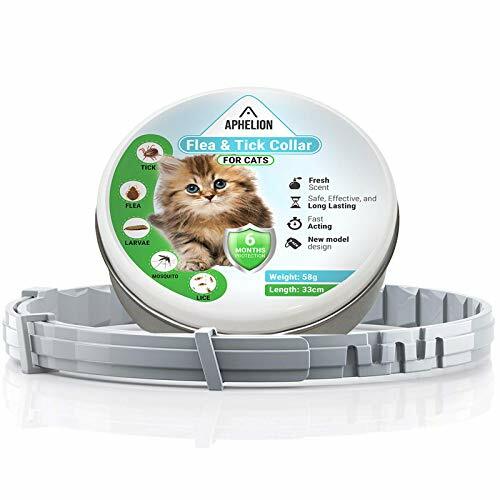 GUARANTEED EFFECTIVENESS - Aphelion collar is a guaranteed natural treatment to safely kill, get rid and repel the insects mentioned above without causing any allergic reactions to your pet. If the infestation is severe, consider multiple collars for multiple treatments. Monitor your pet on a monthly basis to verify improvement. If you have any questions about this product by Aphelion, contact us by completing and submitting the form below. If you are looking for a specif part number, please include it with your message.